If man-made, modern resorts are not your thing, you will probably find Olhos D’Agua very appealing. It is a quiet fishing village and is much the same today as it was a 100 years ago. The pace is relaxed, and fishing is still important to the community, with many traditional restaurants relying on the catch of the day to serve you after sundown. 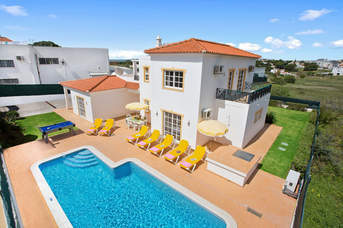 With its whitewashed cottages and cobbled streets leading down to a small, charming beach, Olhos D’Agua is a popular holiday destination for Portuguese families. 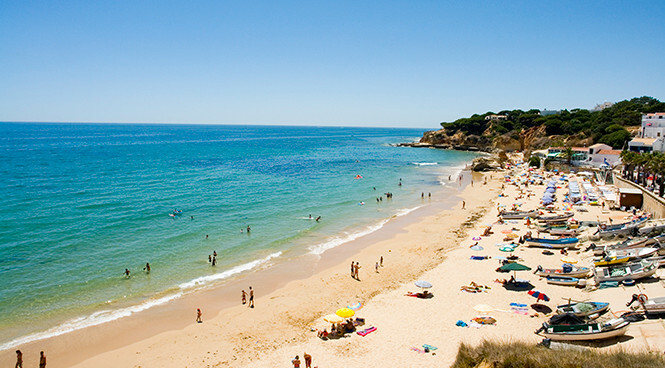 It may be quiet, but you are only 15 minutes away from the far livelier resorts of Albufeira and Vilamoura. If you are fortunate enough to be in Olhos d’Agua in August, you are sure to eat a lot of sardines! The annual Sardine Festival is one big beach party with live music, fireworks and as many delicious barbecued sardines as you can eat! 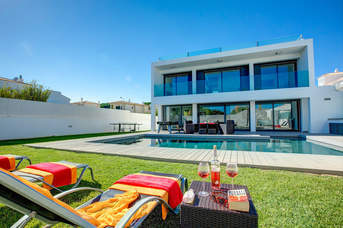 This is a really friendly village and you will be made to feel very welcome.If man-made, modern resorts are not your thing, you will probably find Olhos D’Agua very appealing. It is a quiet fishing village and is much the same today as it was a 100 years ago. The pace is relaxed, and fishing is still important to the community, with many traditional restaurants relying on the catch of the day to serve you after sundown. 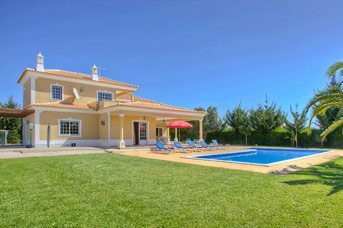 With its whitewashed cottages and cobbled streets leading down to a small, charming beach, Olhos D’Agua is a popular holiday destination for Portuguese families. 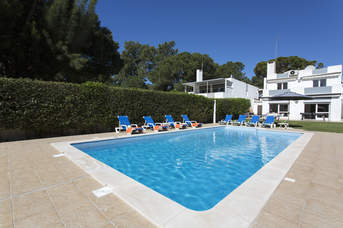 It may be quiet, but you are only 15 minutes away from the far livelier resorts of Albufeira and Vilamoura. If you are fortunate enough to be in Olhos d’Agua in August, you are sure to eat a lot of sardines! The annual Sardine Festival is one big beach party with live music, fireworks and as many delicious barbecued sardines as you can eat! This is a really friendly village and you will be made to feel very welcome. Freshwater springs that bubble through the sands give the village its name, which translates as 'eyes of water'. Children are fascinated by these, and also by the many rockpools that make the beach an ideal, playground. The clear, shallow water allows them to paddle and potter safely for hours while you stretch out on a sunlounger and soak up the rays. The beach is clean and safe, with easy access to parking and plenty of cafes and bars on the palm-fringed promenade as well as toilets and showers. One of our customers commented that it is 'a wonderful beach that is patrolled by very handsome life guards.' How about that for added value, ladies? The Fisherman’s Beach at Olhos d'Agua, embellished with colourful fishing boats, is ideal for families, and has all the facilities you need. The umbrella pine trees on the cliffs and the many caves and coves carved into the limestone make this an extraordinary coastline. 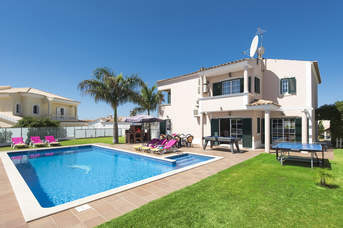 There are many other fabulous beaches a short drive away you’re your villa, such as Santa Eulalia, or the great stretch of sand at Praia da Falesia, flanked by red cliffs. Then there is Praia Maria Luisa, where the calm, warm ocean is irresistible, and you may find yourself windsurfing, waterskiing, jet-skiing, snorkelling or scuba-diving for the very first time. The beach, nestled under a limestone cliff embroidered with pines, has its own car park at the top of a rough track. If you fancy a break from the pool and the beach, head inland and you will find that the countryside gives you a very different aspect of the Algarve. One of the loveliest towns in the area is Loule, which is a 20-minute drive inland, and has both a ruined castle and an art gallery.